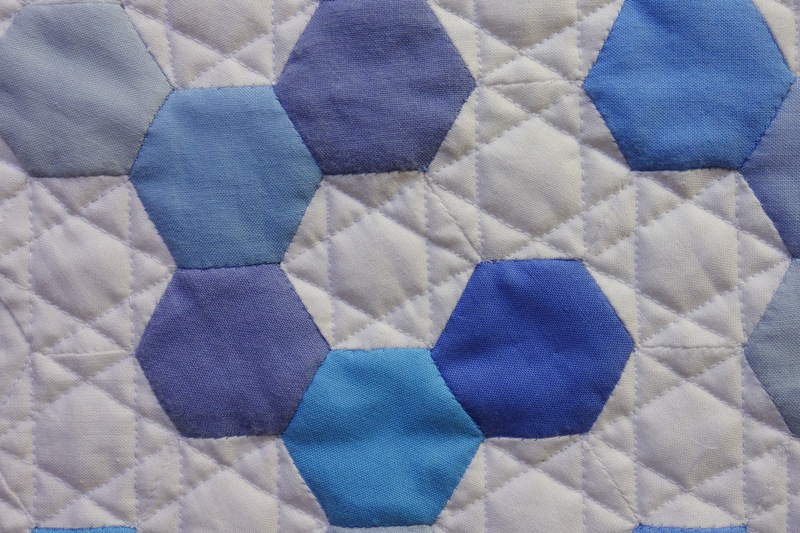 Hexagon Road Through The Blue, 2018, single bed size 59.5in x 72.5in. A stash buster –everything for it came out of the cupboard. I’m not happy that the stripes on the two sides don’t line up at the bottom! Nifty fractal though (original)! I Like a Tight Embrace, 2017, 60cm x 60cm, made for the 2018 Bunbury Challenge, theme ‘I like’. Statement: Orange and beige motifs, embracing tightly. Otherwise they hug, envelop, cuddle, clasp, enfold, encase, snuggle, nestle, conoodle, hold close, entangle – these words are quilted. The design was inspired by the Ter Dragon fractal at www.fractalcurves.com/ . Blue Ice at Daybreak, 2017, 61cm x 64cm. Juried into Australian Quilts in Public Places 2017, theme Reflection. Pale-blue ice reflects light eerily at day break. Crevasses appear darker blue when you gaze down them. Meltwater with ice floating (the hand-dyed fabric) flows from under the ice. Icicles (the beads) reflect and refract light. 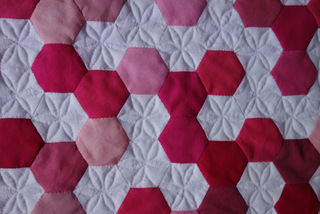 The abstract design involves a six hexagon pattern in two sizes. Colours of the Aboriginal Flag,2017, 55″ x 75″. Juried into Art Quilt Australia, 2017; 2nd, theme category New Heart at QuiltWest 2017; juried into World Quilt Show 2018. Black (people), red (earth, ochre), yellow (sun), colours of the flag that Cathy Freeman carried triumphantly on her Sydney Olympic circuit. That action surely engendered new heart amongst Aboriginal Australians. 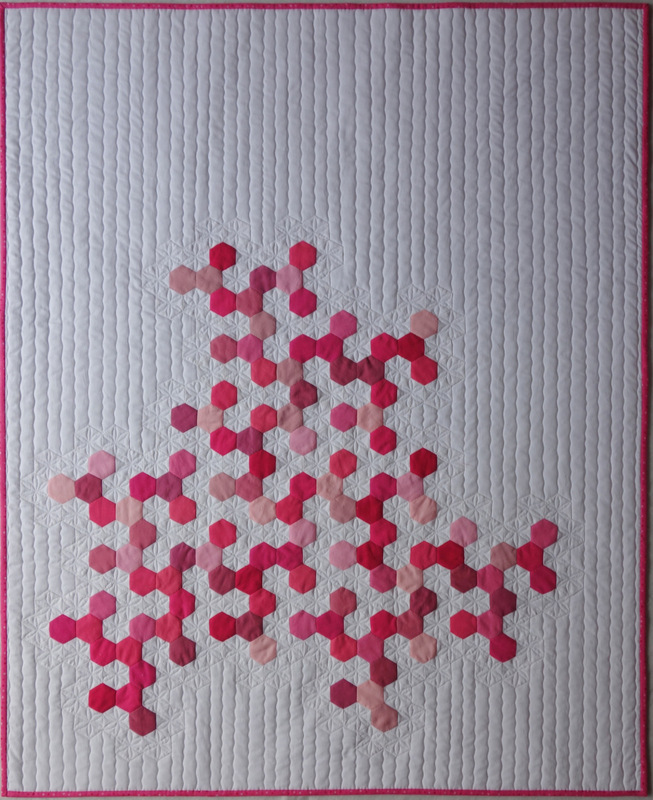 Fractal Growth, quilt book. 2017. Juried into stitched and bound 2017. Just as seeds with different DNA grow to be different plants, patterns that differ generate different fractals. The analogy is apposite because many plants have a fractal form, viz pattern repeated in multiple sizes. This book showcases four patterns and fractals that they ‘grow’ with patterns in two sizes. Cosmic Serpent, 2016, 53cm x 61cm. Juried into Dare to Differ, 2017. Pattern on pattern on pattern (ad infinitum if sewing skills permitted) …… a serpent writhing through the heavens. The figure represents mythological serpents common to many cultures, including the Waugal (Rainbow Serpent) of Noongar aboriginal people. Lit From The Left: Monuments and Stairs, 2015, 30″ x 76″ (the pair), original fractal motifs, the stairs are essentially the monuments tipped, awarded ‘highly commended for artistic development’ in the juried Art Quilt Australia, and 3rd prize in Mixed Techniques/Abstract at QuiltWest 2016. .
Granny’s Modern Garden, 2016, 51″ x 51″, same fractal design as Granny’s Twisted Garden (see below), the fabric in the centres has bees printed on it, dragonflies and snails are quilted, as well as two grades of mushroom mulch and a rock surround. Granny’s Twisted Garden, 2015, 90cm x 90cm, finalist in the Australian Quilt Convention Challenge ‘A Twist on Tradition’, travelled Australian quilt during 2016. A nine-hexagon pattern repeated in three sizes. 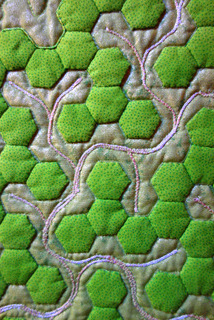 Hand embroidered centres to the hexagon flowers, hand embroidered Western Australian wildflowers, wildflowers scientifically named, free motion quilting in two textures. Kimberley at Sunset 2015, 68cm x 70cm, juried into ‘Australian Quilts in Public Places 2015 Exhibition’. Four-hexagon pattern repeated in three sizes. 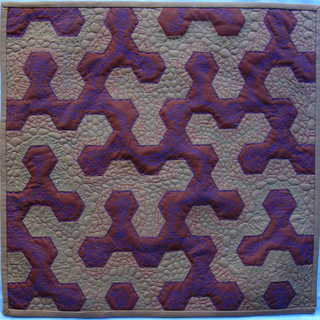 Quilting depicts grassland and woodlands, and Kimberley wildlife. Kimberley Creek 2015, 107cm x 70cm, juried into ‘One Step Further Exhibition 2015’, and NZ Quilt Symposium 2017; featured in ‘Amazing Australian Quilts’ in Down Under Quilts, Issue 174. Lit from the Left: Cubes, 50cm x 70cm, 2015, made for the WAQA (Western Australian Quilters’ Association) ‘Illumination’ Challenge. Original design. Foundation piecing, English paper piecing and applique, hand embroidery! 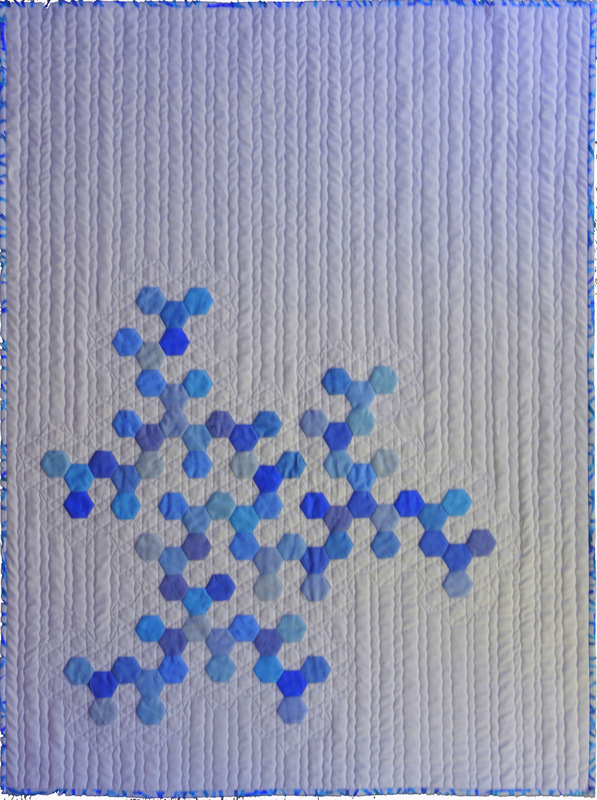 12 Shades of Blue, 2014, 90cm x 120cm, exhibited at ‘Quilted’ , a WAQA (Western Australian Quilters’ Association) exhibition. 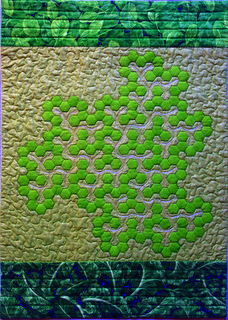 Based on a root 19 triangular-grid fractal by Jeffery Ventrella, see www.fractalcurves.com Pattern in Down Under Quilts, Issue 175. Frilled Lettuce Fractal, 2014, 50cmx70cm, detail on right. Motif is part of the Ter Dragon Fractal with rounded corners described by Jeffery Ventrella, http://www.fractalcurves.com. Made for the West Australian Quilters Assocn ‘Vessels’ challenge – lettuce and other greens are vessels of health and nutrition and the veins in their leaves are vessels for water and nutrients! The wiggle stitch for the quilting lines is called serpentine stitch. The pattern will be published in a magazine next year–will keep you updated!